Here are a few more links to some fun places on the Web. Enjoy! Here's a place where you can list your birthday and find a lot of people who have their birthday on the same day as yours. 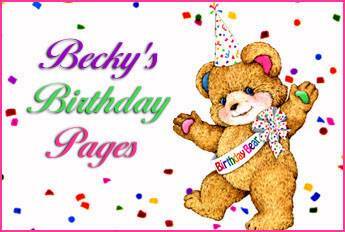 Becky also has a really neat Greeting Card page so you can send cards to all those people with whom you share your birthday. This is a site that is really worth a visit. Meghan is one of our ladies in uniform. Send her an E-mail message and tell her how you found her site. This site was written by a Junior High School class. It's all about the collapse of the Tacoma Narrows Bridge. Here's a WWW Site that's gone to the dogs - or is it for the birds? Anyway it's a couple of my friends in Utah - Ann and Larry. Leave them a message and tell them I said "Hi". If you like poetry you might like Marge's Poetry Page. Tired of the usual 'beeps' and 'boops'? Want some different sound effects for your computer functions? The place to get them is The Daily .WAV. More sound effects - Here's all of your favorite cartoon characters. The U.S Air Force Thunderbirds. This is a site I discovered in Jan 1998. It is an on-line exhibition by a Sweedish artist named Christina. Some of the paintings take a while to load but they are worth the wait. So you want to sing around the campfire or just about anywhere else and you can't remember the lyrics. Well, here they are. Paul's links page is always under construction.